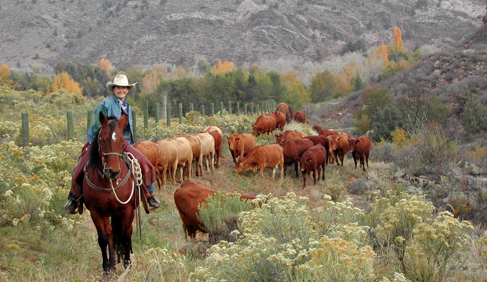 Sylvan Dale Ranch was started in 1946 by Maurice and Mayme Jessup and has grown to 3,200 acres. Today, the 2nd generation of Jessups, siblings Susan and David, continue their parent's commitment and vision, offering guests an authentic Western Dude Vacation experience. While located in the Rocky Mountain foothills, Sylvan Dale Guest Ranch is an easy hours ride from Denver and shares the same elevation, just 5,280 feet, so adjusting to altitude is easy and user-friendly…no headache hassles here. Sylvan Dale Ranch breeds and raises registered American Quarter Horses right here on the ranch, so guests can count on a reliable, responsive, and handsome mount—every ride! 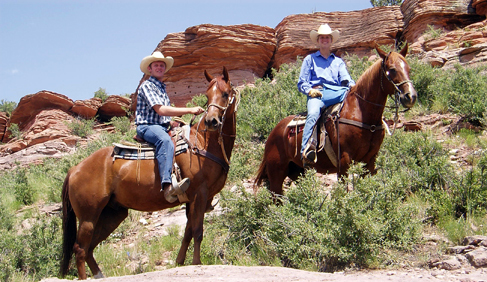 Every guest is assigned their own horse for the week, which provides horse and rider the chance to bond, and enhances the guests experience and overall riding enjoyment on their Colorado ranch vacation. And this Colorado guest ranch's cow-calf operation of registered European cross-bred cattle offers guests a working cowboy experience. Guest cabins are quaint and cozy, surrounded by towering pines and cottonwood trees, just steps from the Big Thompson River. Cabins, the dining room and amenities (outdoor heated pool, hot tub, tennis courts, and game room) are all centrally located within walking distance to each other. While this Colorado ranch has a full service dining room, they often take advantage of dining outdoors, with spectacular views of both the river and the surrounding mountains. 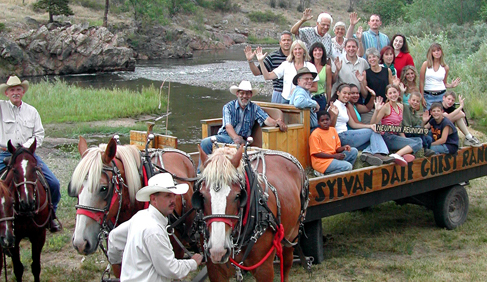 Sylvan Dale Ranch is an all-inclusive vacation, and one price includes all meals, accommodations and riding activities for the week. 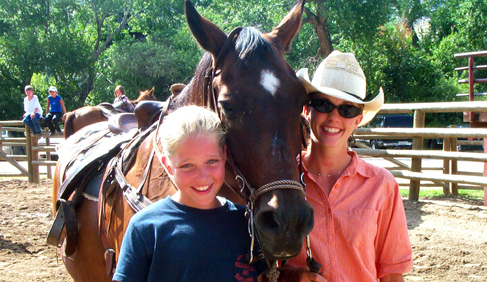 The ranch has kids and teen programs and family oriented entertainment every night. 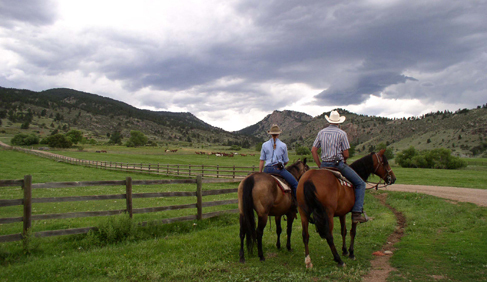 This guest ranch has been named "Best Family Vacation" by Frommer's Colorado guidebook and rated among the "Top Ten Colorado Dude Ranches" by True West Magazine. 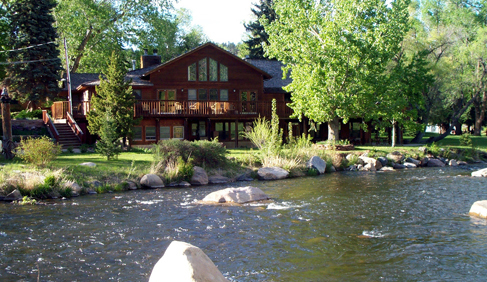 Sylvan Dale Ranch is a family owned horse and cattle ranch, offering horse riding adventures and trophy trout fly-fishing on 3,200 acres in the Rocky Mountain foothills. Bring your mom, your best friend, your daughter, or your sister for an unforgettable stay! Making friendships with other “Cowgirls” and bonding with your Sylvan Dale horse puts this experience at the top of the list. Take advantage of ability-level riding instruction from our wranglers. You'll then be able to use the skills you've learned on adventure rides, team penning, the High Stakes Poker Ride, and the Overnight Pack Trip (summer only). But… don’t think that you have to be an experienced rider to enjoy a great horse experience. Our riding program speaks to all ability levels and we will partner you with just the right mount. Learn more by emailing Karen, calling (970) 667-3915 ext. 11 or visiting the Sylvan Dale website. The ranch's Western lifestyle has a way of slowing you down and gearing you up for a relaxing and fun-filled getaway during this kid-free week. Customized to especially meet the interests of adults, Sylvan Dale offers adult oriented activities like wine and cheese tastings, country dance instruction, guided nature hikes, and trap shooting. Corrientes will be on hand for team-penning, and you won't want to stop once you try your hand at roping! The ranch will gear down the pace for adult only week so you can give yourself permission to escape to Cottonwood Gulch, or the Book Nook and lose yourself in the pages of your favorite book, or drift off for a nap, lulled by the soothing sounds of the river. Here's your chance to follow through with that New Year's Resolution to care-take yourself and your relationships — western style! You deserve it! The ranch welcomes you to join for a trip back in time! Gray Wolf, Shines and/or other historians transform part of the ranch into an authentic, historically accurate Cheyenne camp from the mid-1800s, complete with tipis, buffalo hides, tomahawks, saddles, rifles, buckskin and rawhide, old-time beadwork and much more! Sylvan Dale's regular Dude Ranch program will still be in operation, with the added fun of Tipi Camp and Gray Wolf. After you’ve had your fill of horseback riding, trap shooting, white water rafting, hiking, and various other activities, you can head over to Cottonwood Gulch to spend time at Tipi Camp! You can learn about tomahawk & knife throwing, arrow making, fire making, Native American sign language, wild edibles, and of course the Great Plains culture. Join Cheyenne historians for a week you’ll never forget! This "over-the-river-and-through-the-woods" getaway is perfect for the whole family. After check-in on Thursday, head to the Heritage for a complimentary beverage before sitting down to a Traditional Thanksgiving Feast. Fill the days with horse-drawn wagon-rides, hikes, trail rides, ranch chores, a draft horse workshop, fly-casting clinic, tour of the cattle ranching facilities, natural history and geology tours, and pond fishing. Lots to do…no pressure to do it. Grab a cup of hot cider and allow yourself some football couch time, or snuggle in for a fireside chat with family and newly-made friends. Don’t miss the traditional showing of "The Wizard of Oz," for kids of all ages, complete with popcorn and sodas! You can have the best of both worlds — a traditional Thanksgiving with family and friends and none of the work that typically goes with it! Horseback riding (beginning riders welcome), riding lessons & clinics, massage, yoga, winter vacations, women only adventures, wine and cheese tastings, tennis, volleyball, fishing, swimming, hiking (multiple trails throughout ranch), square dancing, horse shoes, hayrides, talent night. mountain biking (bike rentals available), horse pack trips, budget travelers welcome, cattle drives on designated weeks, fly-fishing, golf (multiple courses within minutes of this ranch), daily horse drives, kid-friendly activities, basketball, rock climbing, dude ranch conferences & business retreats, ranch family reunions. 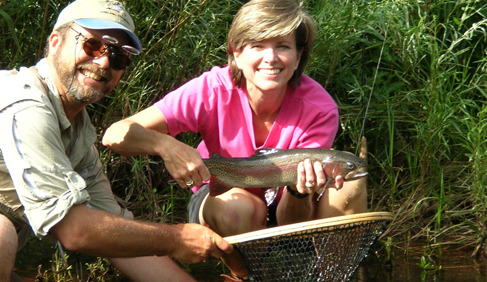 In addition to riding adventures, this dude ranch offers exceptional fly-fishing on the Big Thompson River and exclusive access to private fishing lakes, deep in the Ranch’s “Big Valley”, where guests enjoy ½ day and full day guided fly-fishing for trophy-size trout. There are also fun spectator Events, including the Larimer County Rodeo on select weeks. Winter Ranch Vacations- During the winter months, Sylvan Dale Ranch operates a Bed & Breakfast with optional horseback riding available, weather permitting. Sylvan Dale Ranch is committed to land preservation for future generations. Our sustainability mission: "To apply practices in our daily work routine that support a sustainable operation in harmony with the natural environment through the principles of ‘Reduce-Reuse-Recycle’." • Awarded the 2008 Environmental Business Award by the Ft Collins Chamber of Commerce, recognizing Sylvan Dale Ranch's outstanding efforts to enhance the environmental performance of the organization. • Awarded the 2008 Conservationist of the Year by The Big Thompson Conservation District, acknowledging techniques utilized that conserve land and water. 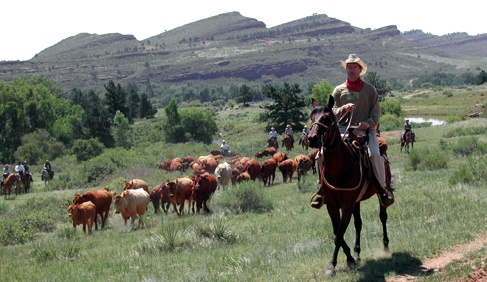 • Working with the Legacy Land Trust, Sylvan Dale has placed 60% of the 3,200 acre ranch in land trust conservation easements to ensure continued protection and freedom from development. Cabins are clustered in the main yard amid giant cottonwoods and blue spruce, and are warmly decorated with comfortable country furnishings and antique accents. All have private baths and porches, carpeting, refrigerators, coffee makers and air conditioning. Some have fireplaces. Guest houses are perfect for larger families or groups and feature 3 or more bedrooms, 2+ baths, kitchens and outdoor patios. All meals are included in your vacation package, and food is plentiful, hearty and home-style. Some meals feature Sylvan Dale's Heart-J grass-finished beef! Sylvan Dale specialties include fried chicken and meatloaf welcome dinner, outdoor steak fry, Thanksgiving dinner and a Mexican Buffet. Home-baked goodies are a delicious tradition. Meals are served in the RoundUp Room, outside at the Heart-J Grill, on the Heritage Porch or on the trail. This guest ranch is happy to accommodate special diets. 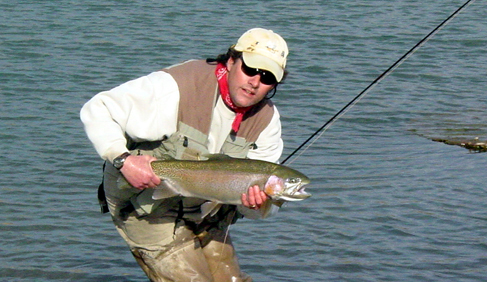 Sylvan Dale Ranch is a family owned horse and cattle ranch, offering horse riding adventures and trophy trout fly-fishing on 3,200 acres in the Rocky Mountain foothills. 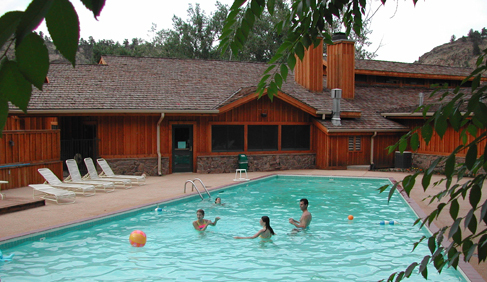 Wheelchair Accessible: Most of Sylvan Dale Ranch's accommodations have limited accessibility. Now Taking Reservations for 2015! Learn more.